One of my great frustrations in developing software that needs to interact with multiple versions, flavors, and configurations of external components and hardware is finding the simplest way to work with all components, each with varied capabilities. A simple and familiar real world example is credit card receipts and printers that support different character width receipts. Receipts include basic transaction details such as the time, amount, card information, processing details, and merchant identification. Many of these fields are mandated by the payment processor. Additional optional details may also be included, such as the employee or order details. This information must fit within different receipt widths such as standards of 24, 32, or 40 characters. In an ideal world with infinite time and resources, one would design software with flexible layouts and configurations to support a wide variety of printers with varying character widths, and even more advanced features such as colored, bold, or different sized text. Unfortunately, we're not living in an ideal world. In the real world, we sometimes need to make tradeoffs to save time and money, and make compromises to make things work adequately in multiple environments. Making short term tradeoffs and concessions often leads to a poorer final product due to the tyrrany of the lowest common denominator. In the case of credit card receipts, we can support multiple receipt width printers if we focus first on the narrowest 24 character width receipts and simply reuse this format for the 32 and 40 character printers by adding a little extra padded space. By restricting ourselves, we are left with a cramped space and receipts that look less than visually appealing. We save effort in terms of supporting all environments at the cost of the final receipt layout, hopefully finding time to one day return and improve things. Beyond this simple example, there are many cases where it may be simpler to throw a feaure away that cannot be supported everywhere. We may choose to reduce a feature's complexity and power in order to support multiple environments. Business is business, and these choices are not necessarily wrong, but it can be difficult to extract myself from the emotional impact of purposely selecting an inferiror design to accommodate shortcomings of a system outside of my control. The tyranny part comes in when the most inferior system dictates the experience for the superior systems, holding them to provide less than their full potential. To overcome this tyranny, sometimes we need to reject the inferior system that is holdng back the rest. When this is not possible, sometimes we can find a way to downgrade a superior solution and wedge it into the lesser environment. Given enough time we can define a system of support for different feature sets, and simply disable advanced features for systems that cannot handle them, but continue to support those features for better environments. And sometimes, when all the stars align, we find the time and resources to do it the ideal way simply because it's great. Enter stage left. Pacing a slow and deliberate gait to center stage, it's time to deliver your lines. Dress rehearsal is here. After weeks of memorizing lines and working with your follow cast members practicing scene by scene, you're nearly ready for opening night. As the director walks everyone through each scene of dress rehearsal, small issues come to light that were never noticed before. Whether it's the wrong lighting arrangement, a misplaced prop, or a scene change that doesn't transition smoothly enough, this is the opportunity to make last-minute adjustments to make sure the show is prepared for success. The cast and crew take their places as the curtain opens. Opening night is packed with eager patrons and critics ready to experience the well-promoted show. The opening act comes to a close to a thunderous applause. Midway through the second act a stage prop malfunctions, causing an awkward pause and a stumbling delivery, breaking the audience's immersion in an otherwise excellent show. The rest of the show goes off without major incident, ending to a satisfying ovation. The analogy is the same in the world of software. It does not matter how many layers of testing suites you wrap around your software. It does not matter that you've tested it in three distinct environments and subjected it to a wide array of contrived and random test data. It does not matter that you've gone over a test deployment twice and three times. You simply cannot know that your software is truly ready for production until it's put to the test with real users and data. I've been around this game long enough to see well-tested systems run into all kinds of surprising bugs. Many bugs would simply never have been caught, even by adding dozens of programming, testing, and hardware resources prior to production release. These bugs are typically inconsistent, difficult to reproduce, or related to users exercising the software in unexpected ways. It's a case of diminishing returns -- performing a variety of basic tests will generally pay immediate dividends as obvious, simple bugs are found. Performing additional rounds of testing will often flush out a few more. As more bugs are found, the rare gems, well-hidden beneath the surface, will become harder and more time consuming to find. Often, it is simpler to release the software and fix bugs as they are reported than to waste valuable resources looking for outliers. As with the theater, it is true in software: the show must go on. Once the production is prepared and the dress rehearsal has worked through the obvious problems, the only thing left to do is to perform for the waiting public and wait for the reviews. If there's one thing I would suggest you take away from this, it's that there's rarely such a thing as a flawless release. Always expect that your software will fail in a way that you've never seen or anticipated. Therefore, be prepared to respond quickly, lest the critics give you a scathing review and the fickle public refuses to come back for an encore. I started programming from a young age. I distinctly recall being in grade 5 and being curious about how some of the games in our school's computer lab worked. Having absolutely zero clue, I checked out a book from the school library on programming for the Apple IIe. My first programming experience was typing out Apple BASIC programs straight from the book and watching them fail as my two-fingered hunt-and-peck typing resulted in multiple typos. My exposure to computers was reasonably limited until my sister and I pooled our money to buy a 100MHz 486 (with TURBO on for maximum fastness). I'm pretty sure I got the better end of that deal as I began spending a lot of time both playing video games and experimenting with QBASIC and its elaborate but confusing help files. In high school, I took a few courses in Turbo Pascal and C++ programming. This mostly involved running through a bunch of easy exercises in each chapter and then spending the rest of our class time playing in the lab or working on our frighteningly terrible video game group project. That Pascal text book may be the only high school textbook that I've ever read from cover to cover. What Do You Mean This Is Insecure? With so many courses behind me, I was sure that I had covered most of the important topics. If security was so important and difficult, surely someone would have covered it in one of my course by now. I was surprised when one of my colleagues pointed out security flaws in my code. I did not even recognize it as a flaw when it was pointed out to me. Over time, with the help of more experienced mentors, bloggers, and some job-sponsored training, I began to learn a lot more about secure coding techniques. For many of my experienced readers, these have likely become second nature. Still, everyone can stand a refresher on the basics now and again. 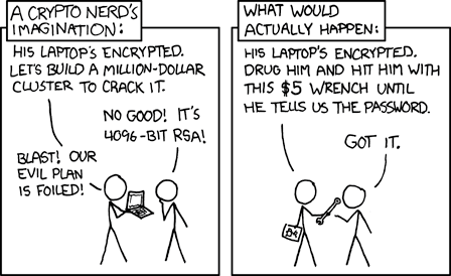 For those who, like I once was, may still be in the dark about secure coding, you have a great deal to learn. With that in mind, I declare the next month to be security month here at Amish Programmer. I will strive to get back on board the posting train and publish a brief post covering such security topics as injection, buffer overflows, and more. These topics have all been covered in depth by others. I will try to present a fresh take on these topics using code snippets and straightforward examples. You can tune in in the coming weeks for a short discussion of several fundamental topics in secure coding. I hope to see you back here soon. Today's brief post was inspired by my recent road trip with my wife from here in Vancouver, BC through the states of Washington and Oregon. When it comes to road trips, I'm all about efficiency. Pit stops run like clockwork. The guys from NASCAR have nothing on me. That's why I prefer self service with pay-at-the-pump when stopping for gas. My fingers fly with precision as I fetch my card from my wallet, insert it in the machine and punch my way through the menu to start up the pump and select my grade of gasoline to begin fueling. Unfortunately for me, as a Canadian, I don't have a numeric 5-digit zip code. Instead, I have a six character postal code with a mix of numbers and letters. Try though I might, I could not find a way to enter my postal code or skip this prompt. After a few moments of poking around at the machine, I eventually resorted to pressing cancel and walked into the station to speak with the cashier. Within a few minutes I was back on track (a lap behind the race leaders). My experience with the zip code prompt was hardly life altering. Still, it illustrates some of the problems that can come up when your software makes incorrect assumptions (e.g. all gas station customers have a zip code). Challenge your assumptions and do your best to consider all possible users. Question whether all the information you prompt for will be available or match your expected format. If not, your software should gently guide the user on how to proceed. P.S. Did you see the seventh inning of today's Blue Jays vs. Rangers game? It was well worth a second look! Go Jays!